Figure A6. Alps anomaly, interpreted as the Alps slab, with (horizontal) [vertical] cross sections through (A)[D] the UUP07 p-wave) and (B)[D] the combined SL2013 and S40RTS s-wave models at 730 km; C) the location of the modern geological record that we interpret to have formed during the subduction of the slab. The Alps anomaly (Figure A6) was first detected by Spakman (1986b), Kissling (1993) and Kissling and Spakman (1996) and was interpreted by Spakman and Wortel (2004) as the remnant of the Piemonte-Ligurian ocean that subducted in the Alps. 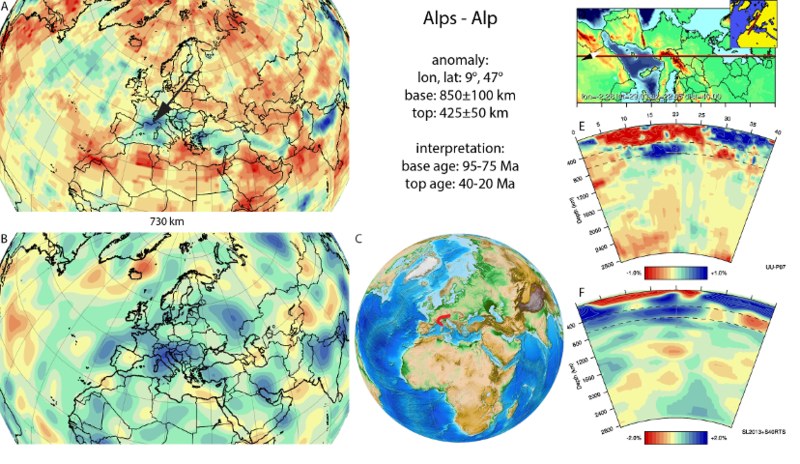 The Alps anomaly is interpreted as a curved body of detached lithosphere that follows the oroclinal shape of the western Alps, and lies on the 660 km discontinuity, with its base penetrating the upper part of the lower mantle, reaching ~800 km depth. The Alps slab is disconnected from shallower anomalies below the western and eastern Alps that are imaged to less than 200 km depth (Lippitsch et al., 2003; Kissling, 2008) and that are interpreted as European continental lithosphere in the west, and Adriatic continental lithosphere in the east that subducted in the last 20 Ma (e.g., Schmid et al., 2004; Handy et al., 2010; 2014). The Alps slab likely represents oceanic lithosphere of the Piemonte-Ligurian and Valais oceans and continental lithosphere of the intervening Briançonnais microcontinent (Handy et al., 2014) that subducted in the Alps. The oldest definitive record of subduction, with a southward vergence, in the geological record of the western Alps is the HP-LT metamorphism of the Sesia zone, with an age around 75-65 Ma (Handy et al., 2010) and references therein). Subduction must have started prior to this time, and may have initiated due to a change in relative Africa-Europe convergence from E-W to N-S around 85 Ma (Handy et al., 2014), which we adopt as the age of the base of the Alps slab, with a somewhat arbitrary but conservative uncertainty estimate of ±10 Ma. Break-off of the Alps slap was interpreted to be reflected by a series of granitoid intrusions of 33±8 Ma (von Blanckenburg and Davies, 1995). In more recent years also rapid uplift and exhumation in the Alps in the Early Oligocene was interpreted to possibly reflect a phase of slab break-off (Jourdan et al., 2013). In any case, breakoff of the Alps slab in the eastern Alps must have occurred prior to the onset of northward underthrusting of Adriatic lithosphere, which according to geological interpretations of the southern Alps occurred since ~20 Ma (Ustaszewski et al., 2008). Following these constraints, we conservatively adopt an age for the top of the Alps slab of 30 ± 10 Ma. I have a problem. From Mesozoic to Eocene the South-western sector of the Alpine chain extenden from Piedmont to Gibraltar. When the onset of the westward Apenninic subduction begun, the roll-back of Sardinia and Italy opened the Western Mediterranean basins, resulting in the fragmentation and dispersal of the SW sector of the Alpine chain. Are there some traces of this slab deep in the mantle, presumably under Italian Peninsula? Yes, there are certainly traces of that: the subduction of the Piemonte-Ligurian ocean to the southwest of the Alps led to a series of separate slab fragments: the North Apennine slab, the Calabria slab, the Kabylides slab, and the Gibraltar slab. You may check out van Hinsbergen et al., Tectonics 2014, for a reconstruction.